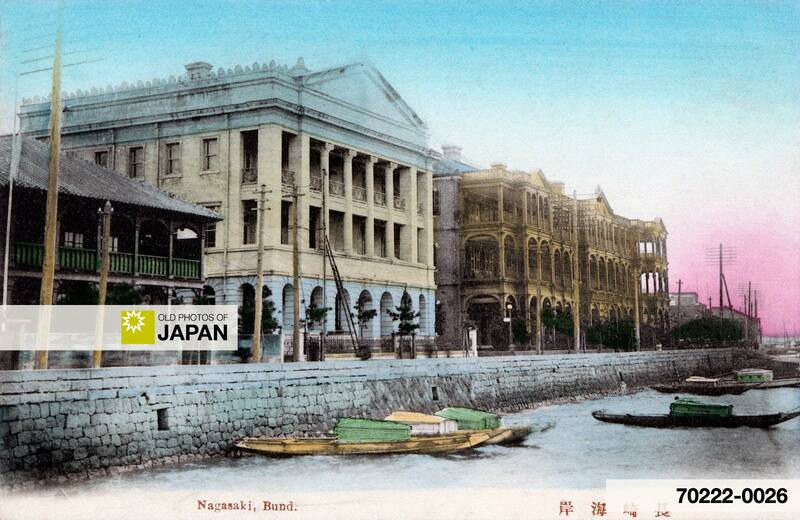 This postcard of around 19071 shows two important buildings on the Bund in Oura-Sagarimatsu. The large white building is the Nagasaki branch of the Hongkong Shanghai Bank, the brown building on the right is the Nagasaki Hotel. At that time, they were right on the edge of Nagasaki harbor and just a short walking distance away from Deshima (also: Dejima) island. The Hongkong and Shanghai Banking Company Limited, now known as HSBC, was established in Hong Kong in March 1865 to finance the growing trade between China and Europe. In 1866, it launched its first branch in Japan.2 The building on this photo was designed by Japanese architect Kikutaro Shimoda (1866-1931) and opened in 1905. It still stands and is the only remaining building designed by Shimoda. The first floor of the three-story building features Chicago-style windows with repetitive curved arches and an arcade. Circular Corinthian columns embrace the second and third floor. The building is crowned with a pediment. 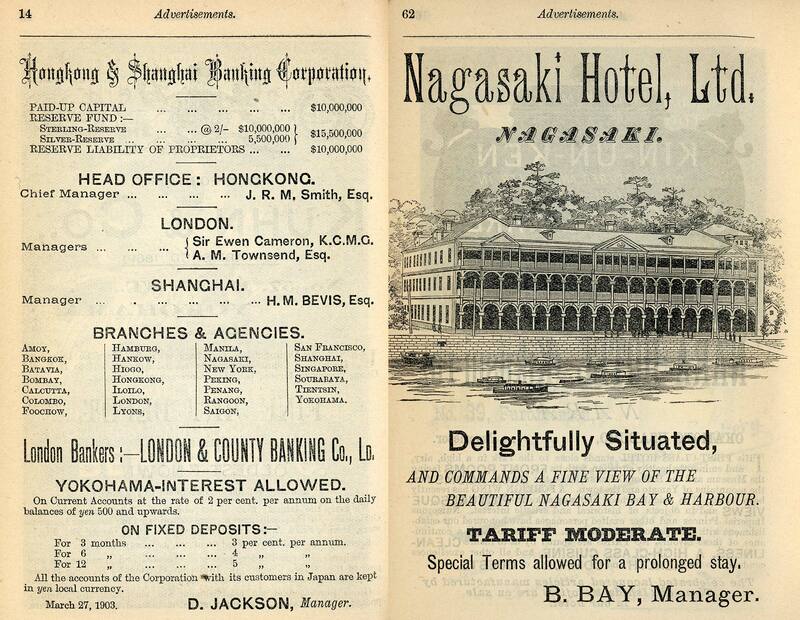 Ads for the Hongkong Shanghai Bank and the Nagasaki Hotel from the 1903 edition of A Handbook for Travellers in Japan by Basil Hall Chamberlain and W. B. Mason. 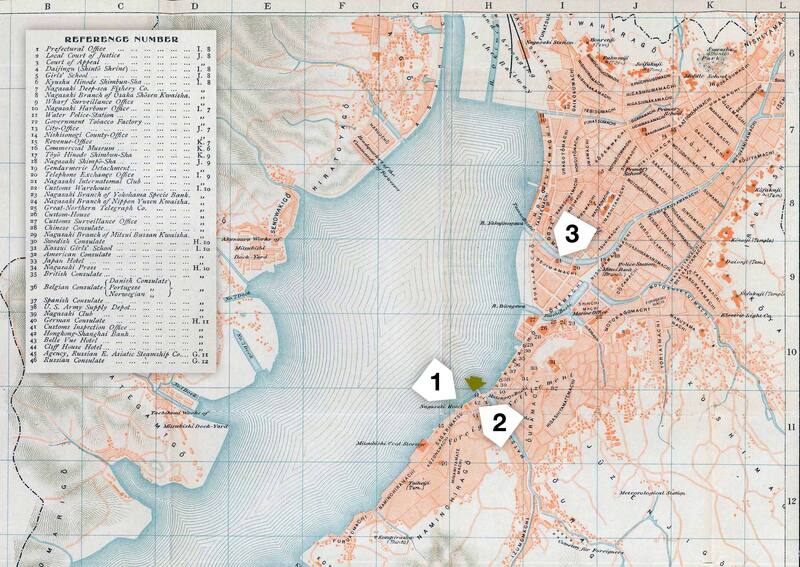 1928 (Showa 3) Map of Nagasaki: 1. Nagasaki Harbor; 2. Oura Bund; 3. Matsugaebashi on the Matsugaegawa (松ヶ枝川); 4. Customs Inspection Office; 5. Hongkong Shanghai Bank; 6. Oura Church (大浦天主堂). This map dates from 1928, at least 21 years after the photo above was taken and four years after the closing of the Nagasaki Hotel. 1 I have seen a version of this card with a postmark of July 1907, which determines that the photo must have been taken that year, in 1906, or possibly shortly after the opening of the Hongkong Shanghai Bank in 1905. 2 Wikipedia. The Hongkong and Shanghai Banking Corporation. Retrieved on 2008-07-29. 3 長崎県観光情報システム。Hong Kong Shanghai Bank Building. Retrieved on 2008-07-29. 4 Nagasaki Foreign Settlement Research Group. Nagasaki Hotel. Retrieved on 2008-07-29. 5 (1914) An Official Guide to Eastern Asia: Vol. II South-Western Japan. The Imperial Government Railways, 41. You can also licence this image online: 70222-0026 @ MeijiShowa.com. I read with interest your contribution on the Nagasaki Bund depicting the buildings of the Hongkong and Shanghai Bank and the Nagasaki Hotel. As for the latter building you also Show an advertisment with Bindo Bay as Manager. According to my present research B. Bay was proprietor of the Belle Vue Hotel. Do you know what has happened to the Belle Vue Hotel? And maybe even to Mr. Bay? I have another item of 1904 in which a certain G. L. A. Smith is mentioned as Manager of the Nagasaki Hotel.